Stunning stainless steel wine chiller can be personalized for an excellent wedding, anniversary, new home or retirement gift. Orders ship in 48 hours. This personalized stainless steel bottle chiller can hold up to three bottles and is the perfect personalized gift to celebrate a wedding, wedding anniversary, or new home. This personalized wine chiller can take center stage at your dinner celebration and will keep your wine perfectly chilled. The stainless steel finish is non-tarnish and will be a great looking display piece in your home for many years. 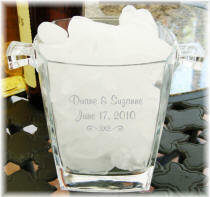 We personalize on one side to create a wonderful personalized gift. Oh la la! This French made ice bucket will sparkle on your bar top. Perfect for serving pre-dinner cocktails, or for a romantic after dinner drink. Makes the perfect gift for a new home, a new man cave, or for a newly wed couple. Anyone will appreciate the additional engraving of a name, family name, monogram or initial. Sized at 5 1/2 in x 5 3/4 in this ice bucket is perfect for a small gathering. We love the stylish design and side carry handles.